Seguin's Headless Ghost, The Ghost on Milam Street. Milam Street in Seguin is a quiet, peaceful byway with some beautiful Victorian homes lining part of it. They share the street, come some nights, with a most unusual ghost. 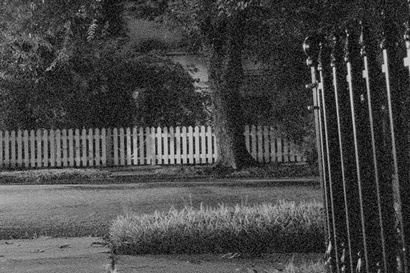 Nobody knows where he originated, this ghostly figure that walks the east side of Milam Street. 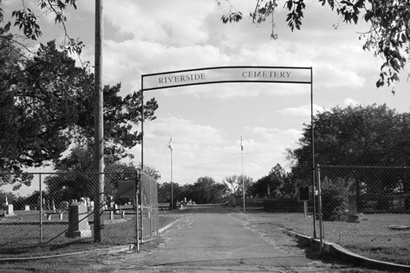 The street ends--or once did--at Riverside Cemetery, one of the oldest cemeteries in Seguin. It's pretty obvious, then, where the ghost's walk starts, but why he walks so purposefully to the north, no one knows. No one, in fact, has any idea who he was. Or why he has no head. It's rumored that he was a Confederate soldier whose head was lost to a cannonball during some battle in the East, and the remainder of his body was shipped home by rail. He walks Milam hoping to catch a train back East, to find his head. However, the railroad didn't reach Seguin until 1877, when the War had been over for 12 years. At College Street Milam makes a slight jog to the west, then continues on north. The ghost doesn't make the jog. He continues to walk straight north, alongside the west wall of a small house owned by friends of mine. Their cats apparently ignore the apparition, but their dogs take definite notice of it. Friends of theirs have stayed with them, sleeping--or trying to sleep--on the living room sofa. Nobody's done that more than once. There's a certain effect when the ghost walks along the outside of the wall the sofa sits against that no one, apparently, wants to experience twice. Junction of College and Milam Street showing brush and trees directly in the Headless Walker's path. Yet who was this headless--well, he's not a horseman, so maybe he's the 'headless walkman'--walker? Nobody, apparently, has any idea. There seem to be no stories--other than the Confederate soldier one--about him. No one has attached a name to him, though it would seem to be obvious that he's buried in what was once the town's finest cemetery. I have never found a story about a headless person being buried there.